Define your company's strategy for the use of social media - Executive managements should define the objectives they which to achieve with social media. Only the can they determine the scope of their initiatives before they deploy them and that those responsible for social media initiatives articulate how the organization's mission, strategy, values and desired outcomes inform and impact on these initiatives. There are many possible purposes for social media. It can be used for various levels of interaction (ranging from monitoring to co-creation) and across different constituencies (employees, business partners, customers and prospects, and the social Web). Write and maintain the policy - Some companies assign policy writing to the CIO, others have decided it's the general counsel's job, while in other cases; a self-appointed committee crafts the policy. 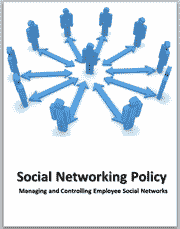 A good starting point is the Social Networking Policy Template created by Janco (see https://www.e-janco.com/SocialNetworkPolicy.html). Policy vetting and approval process - The first step is getting broad feedback. This ensures that multiple disparate interests such as legal, security, privacy and corporate branding, have been adequately addressed and that the policy is balanced. In addition, this increases the amount of buy-in when a diverse group of people is asked to review and comment on the policy draft. This means that the process, by which the policy will be reviewed and discussed, along with the feedback, will be incorporated into the final copy. A vetting process that includes social media makes it more likely that this will occur. Communicate responsibilities - Do not confuse policy creation with policy communication. A policy should be well-written and comprehensive, but it is unlikely that the policy alone will be all that is needed to instruct employees about their responsibilities for social media. A well-designed communication plan, backed up by a training program, helps to make the policy come to life so that employees understand not just what the policy says, but how it impacts on them. It also explains what the organization expects to gain from its participation in social media, which should influence employees in their social media interactions. Monitor Social Networks - Managers need to understand policy and assumptions and how to spot inappropriate activity, but their role is to be more of a guide to support team self-moderation, rather than employ a top-down, monitor-and-control approach. Train managers and coach employee, partners and customers in social media use - There needs to be a plan for how the organization will give managers the skills needed to effectively utilize social networks. Update the policy as needed - Organizations that approach social media using an organized and planned approach, consistent with the organization's mission, strategy and values, will be able to review how well these initiatives meet their objectives and use that insight to improve existing efforts or plan future projects better.